Would You Delete Snapchat Because of Politics? Home > Would You Delete Snapchat Because of Politics? You may have a few friends who are posting about politics on their social media sites. Twitter, Facebook, Instagram, WordPress, Snapchat, etc. Political posts are all over the social web. 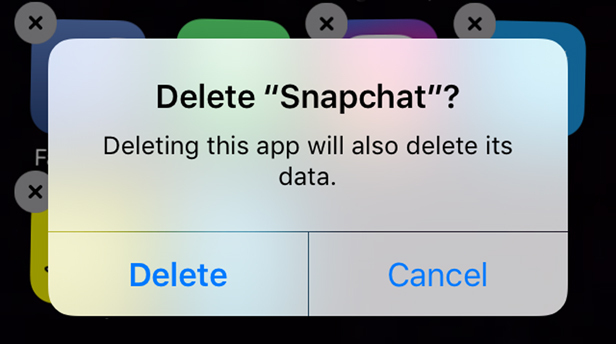 Recently, a friend of mine who is a senior student affairs officer posted a screenshot on Facebook indicating that they were going to delete Snapchat from their smartphone. A super savvy social media user, my friend uses a variety of social networks to connect with their campus community. A commenter on the Facebook post asked why Snapchat was slated for deletion. Sharing a link to a news story about a certain politician's decision to run a nationwide Snapchat geofilter , my friend had taken umbrage with said filter. Now, it's not as if other candidates for POTUS have kept political attacks  off of Snapchat. However, depending on who you are supporting for President of the United States, an attack ad/tactic  could cause a negative association with the app/channel where it's being delivered. According to Nielsen data , "Snapchat reaches 41% of all 18 to 34 year-olds in the United States." That's a phenomenal amount of reach. Recognizing their influence with their core demographic, Snapchat has been running a campaign to encourage voter registration . In this year, as is the case for every other presidential election year, digital engagement channels are rife with political ads, posts, arguments, etc. However, the channels themselves are merely conduits for messages. People post a lot of unpalatable commentary on social media. Facebook, Twitter, YouTube, Snapchat, Instagram, et al. are what we make of them. While I think it's rather tasteless that Snapchat took money from a candidate who labeled their opponent (via a nationwide geofilter) as "Crooked," it was probably a smart business decision. Snapchat received a mountain of press about this action in addition to the money that they earned. Fortunately, at the end of the day, it made it quite easy for one candidate to take the high road whilst her opponent went with their usual lowbrow maneuvers. My friend's initial post about deleting Snapchat influenced at least one other senior leader at a university to delete Snapchat. I think that's the wrong move. As always, the answer to negative speech is more speech. Don't delete Snapchat, use it instead to build community and create connection. While we can't afford to purchase a national geofilter (because we pay our taxes), we can create daily stories to ask questions, create opportunities for dialogue, and foster learning moments...even on Snapchat.